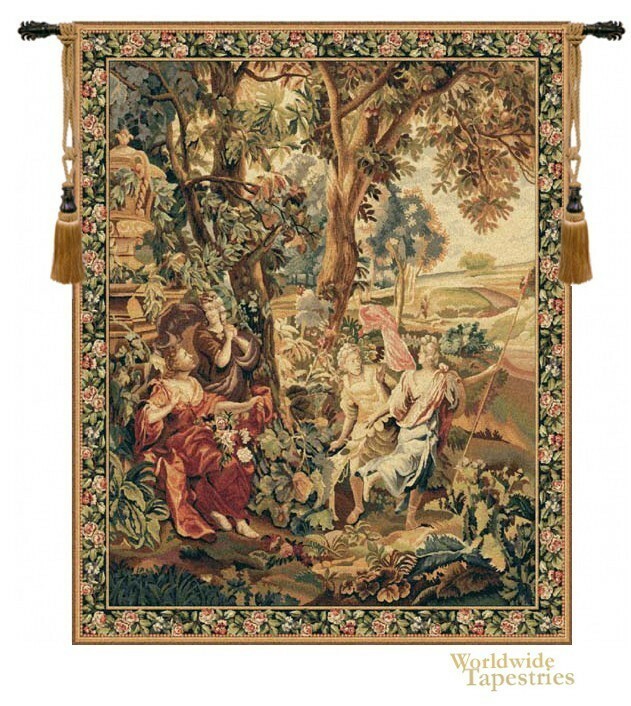 A tribute to the verdures of the French tapestry era of the 17thg century, this "Country Scene" tapestry shows a mythological scene from the countryside. Here we see the lovely toned foliage of the lush trees as well as ground plants, with the ladies enjoying the beauty of the countryside, which is the main focus of the verdure, to celebrate nature. A large classic urn is also seen in the pastoral setting. An ornate floral border completes the work. This art tapestry "Country Scene" is backed with a lining and has a tunnel for easy hanging. Note: tapestry rod and tassels, where pictured, are purchased separately. Dimensions: W 53" x H 66"